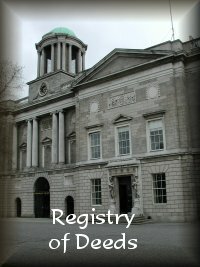 The GRO includes registrations for births, marriages, and deaths beginning on 1 January 1864 (non-Catholic marriages were recorded beginning 1 January 1845). Certificates are available at the GRO. Indexes can be searched 9:00 am–4:30 pm Monday–Friday. There are fees for both searching and obtaining photocopies and certificates. The GRO holds post-1922 vital records for the 26 counties of the Republic of Ireland. 8 Blocks. In June 1988, the Public Record Office of Ireland and the State Paper Office were joined to form the National Archives. The reading room at the headquarters is open to holders of a current Reader’s Ticket. The reading room is opens at 9:15 am.- 5:00 pm. Monday- Friday. 7 Blocks. The National Library of Ireland was established in 1877. The Genealogical Office, which originated in 1552 as the Office of Arms, has been part of the National Library since 1943. There are close to a million books and extensive collections of newspapers, manuscripts, photographs, maps, and prints in the library. The collections are accessible free of charge to holders of a current Library Reader’s ticket. The main reading room is open 9:30 am–7:45 pm Tuesday–Wednesday, 9:30 am–4:45 pm Thursday–Friday, and 9:30 am-12:45 pm Saturday. 1/2 Block. The function of the Registry of Deeds is to provide a system for recording the existence of deeds and conveyances affecting “unregistered” land, i.e. land and property, the title to which is not registered in the Land Registry. The indexes and many of the records are on microfilm. The Registry is open 10 am–4:30 pm Monday–Friday. Records of interest to genealogists include registered deeds from 1708 and wills 1708–1832. Taxi Ride. The Representative Church Body Library is the Church of Ireland’s principal repository for its archives and manuscripts. The reading room is open 9:30 am–1 pm and 2 pm to 5 pm Monday-Thursday. The Library holds records from more than 800 parishes in the Republic of Ireland. Taxi Ride. The Valuation Office is a favorite research facility of Celtic Quest registrants. This office is open 9:15 am–4:30 pm Monday–Friday. The Revision (or Cancelled ) Books are invaluable. A scanned copy of the original series of Valuation maps that correspond to Griffith’s Primary Valuation are available for Republic of Ireland research, and copies can be purchased. 8 Blocks.